One of the most difficult pilgrimage yatra in India refers to the five temples of lord Shiva in the high Himalaya - kedarnath, Madhyamaheshwar, Tungnath, Rudranath and kalpeshwar. It is popularly believed that the Pandavas, after their victory in the Mahabharata wished to pay homage to lord Shiva to atone for gotra hatya – killing their kin, the kauravas. At kedarnath, seeing the Pandavas coming, lord Shiva disguised himself as bull. However the Pandavas saw through this disguise. Realizing that the disguise has not worked the bull tried to thrust itself into the ground. Bhima tried to hold the bull to prevent it from vanishing. In the struggle that ensued, Shiva got torn into separate parts that manifested themselves at various locations in kedarkhand. The forehead appeared at Pashupatinath in Kathmandu; the hump at kedarnath; the torso including the navel at Madhyamaheshwar; the arms at Tungnath; the face manifested itself at Rudranath and the legendary matted locks of Shiva at kalpeshwar. The five sites that fall in India are referred to as Panch kedar. It is held that the Pandavas and their descendents built the temples at kedarnath, Madhyamaheshwar and Tungnath. Rudranath and kalpeshwar however remained cave temples. in the early morning after breakfast drive to Haridwar lunch on th way and continue drive to haridwar chick in to hotel over night stay at haridwar. Morning after breakfast drive to Devprayag chick in to hotel and lunch after lunch sightseeing at Devprayag and dinner over night stay at Devprayag. Deoprayag is regarded as the most entire showcase of legends, tradition and society. 70 km from Rishikesh , here the Bhagirathi from Gaumukh and the Alaknanda from Satopanth join and for most Indians, this meeting is no less holy than the Sangam at Allahabad. These 3 rivers flowing royally through sculptured channels carved through the rocks have carved angular blocks of land around the confluence and the city is set into these 3 angles. To be found at a height of only 618 m, Deoprayag is an invocation to the gods who have kindly endowed this spot with remarkable natural beauty. It is believed that Lord Rama and his father King Dashratha did penance here. The temple of Raghunathji houses a tall picture of Lord Rama made of black granite. The most celebrated event at Deoprayag is the congregation of devotees, who come here to worship at Raghunath temple. In the early morning after breakfast drive to Rudrapryag chick in to hotel and lunch sightseeing tour in Rudraprayag and dinner over night stay at Rudrapryag. 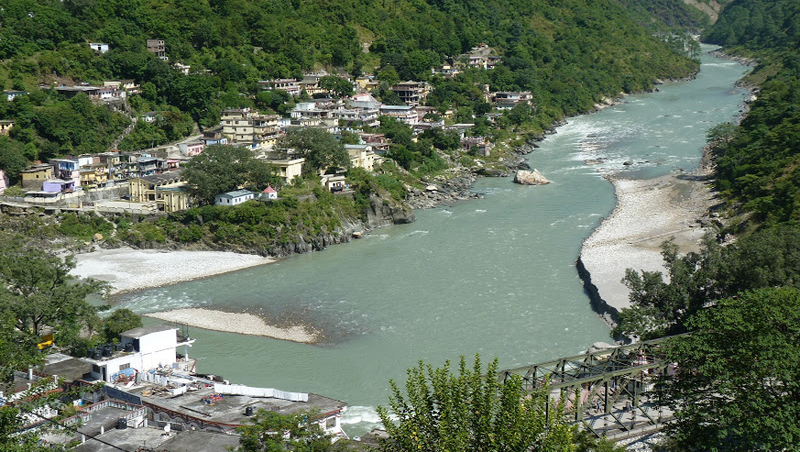 Rudraprayag is the joining point of Alaknanda and Mandakini rivers. The place get its name from Lord Shiva, also known as Rudra. Hindus trust that the sage Narad worshipped Lord Shiva here to be blessed with the mastery of music mysteries. 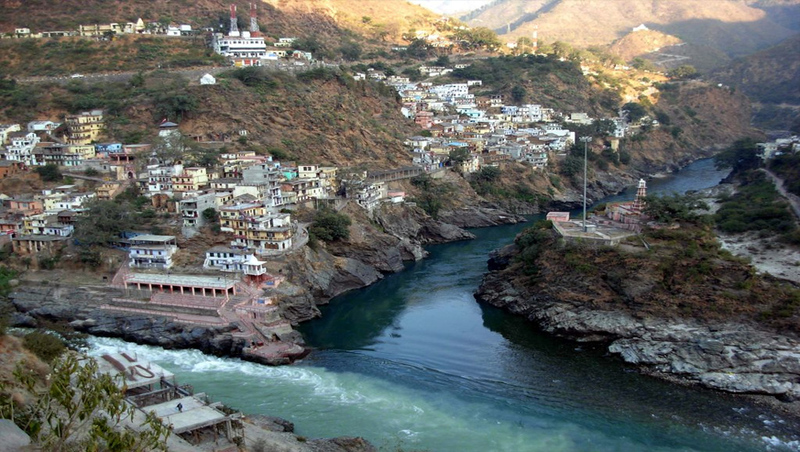 Rudraprayag also commemorates the event when Sati, consort of Lord Shiva, took rebirth after her self immolation. The shrine of Kedarnath is at 84 km from Rudraprayag while Badrinath shrine is at 159 km from here. Morning after breakfast drive to Karanprayag chick in to hotel and lunch after lunch sightseeing at Karanprayag and Dinner over night stay at Karanprayag. The icy flow from the Pindari glaciar becomes the Pindari river, and when it joins the Alaknanda at 788 mts, the confluence is recognized as Karnaprayag. The wooded thickets of the hills surrounding Karnaprayag were the meeting ground for Shakuntala and Dhyanta, immortalised in Kalidasa's immortal classic of the same name and a preferred ballad ever since, There is a temple dedicated to Karna here, the son of queen Kunti and her fiery lover, Lord Surya. Karna's lineage was kept a secret, but he practiced austerities before his father and was granted the boon of a pair of earrings and armour that made him invincible, finally, he fell in the bettle the Pandavas and Kauravas, but he remin a tragic hero for in life he never had the legitimacy he desired. Other temple at the confluence are dedicated to Narayan, Gopal, Shiva and Uma. Morning after breakfast drive to nand prayag chick in to hotel and lunch after lunch sightseeing at nand parayaj and dinner over night stay at Nandprayag. 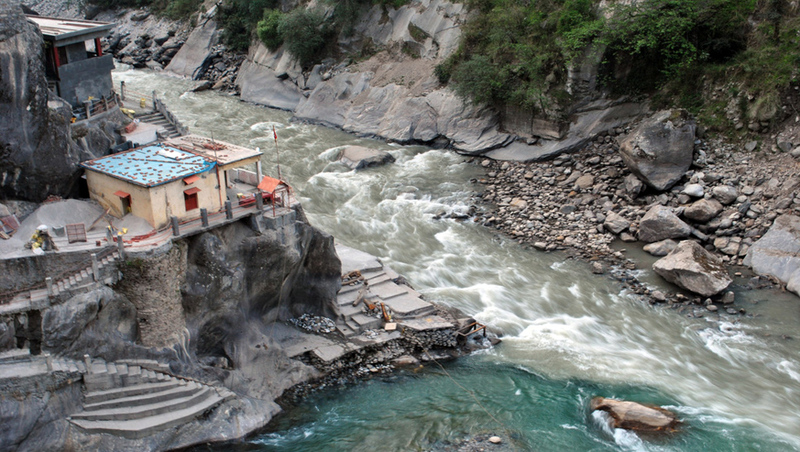 Green Nandakini River, creating from a glacier near Nanda Devi, receives the lighter coloured Alaknanda at Nandprayag with the confluence noticeable by a brightly colourful, triangular concrete block. Steps lead down to the banks of both rivers. Fable has it that this prayag was previous recognized as Kanvasu, later than Maharishi Kanva who had his ashram here. 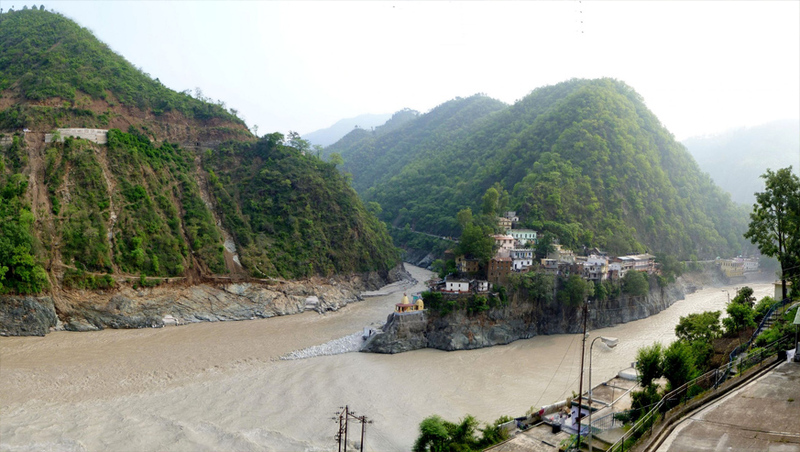 It was only after King Nand maked a Maha Yagna here that it took on the name of Nandprayag. Nandprayag is unique in that there is no temple on its ghats. Earlier period, a temple dedicated to Nanda Devi got washed away along with its priest in a flash flood. However, the close to shrines of Gangeshwar Mahadev, Chandika Devi and Gopalji are worth a visit. Morning after breakfast drive to Joshimath lunch at Bishnuprayag sightseeing and drive to Joshimath chick in to hotel Dinner over night stay at Joshimath. Formed by the meeting of the impetuous Vishnu Ganga (recognized, after this point, as the Alaknanda) and the Dhauliganga rivers, Vishnu Prayag, 1,372 mts. has an very old temple here by a pool known as Vishukund. It is said that the sage Narada worshipped Vishnu at this holy place, and the Lord, pleased with his austerities, had given him his blessings. Visitors are find the Kagbhusandi lake bewitching with its bright green depths giving it a still surface, while on the banks, blossoms evoke the colours of nature in all her magnificence. The lake can be move toward from either Bhundar village near Ghangaria or from Vishnu Prayag. Morning after breakfast drive to Badrinath chick in to hotel and lunch after lunch, Later at evening visit Badrinath Temple for Aarti. Over night stay at Badrinath. Morning breakfast after having a bath in the Taptkund have the Darshan of Badrivishal. Brahamakamal is significant for Pinddan Shraddh of ancestors). There are other interesting sight seeing spot like Mana, Vyas Gufa, Maatamoorti, Charanpaduka, Bhimkund and the "Mukh" of the Saraswati River. Just within the three kms of Badrinathjee, Later drive to Joshimath. Check in Hotel. Dinner over night stay at Joshimath. Morning after breakfast drive to Rishikesh. 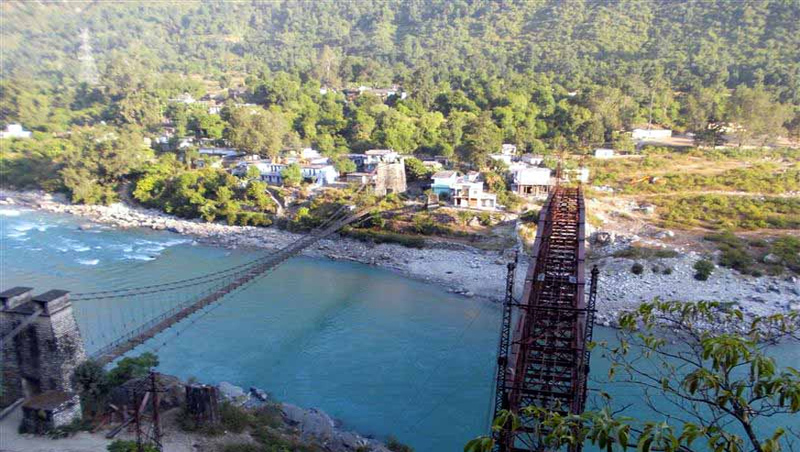 Via Devprayag check in hotel at Rishikesh. Dinner and over night stay at rishikesh.